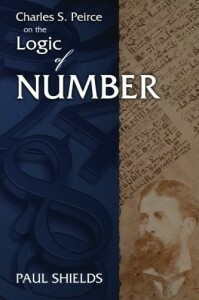 So this is to announce that Charles S. Peirce on the Logic of Number has been pub­lished by Docent Press. It was originally written over 30 years ago. In 1881 the American philosopher Charles S. Peirce published a remark­able paper in The American Journal of Mathematics called “On the Logic of Number.” Peirce’s paper was a watershed in nineteenth cen­tury mathematics; it contained the first successful axiom system for the natural numbers. Since scholarship has traditionally attributed priority in this regard to the axiom systems of Richard Dedekind, in 1888, and Giuseppe Peano, in 1889, we will show that Peirce’s axiom system is actually equivalent to these better known systems. It is not generally known that Peirce’s 1881 paper provided the first abstract formulation of the notions of partial and total linear order, that it introduced recursive definitions for arithmetical operations, nor that it proposed the first general definition of cardinal num­bers in terms of ordinals. Peirce was probably America’s greatest philosopher, and his interest in the foundations of mathematics was closely tied to his main philosophical concerns. Some of his most characteristic philosophical positions – his synechism and his phenomenological categories – bear the direct imprint of his research into the theory of sets and transfinite numbers. Peirce’s 1881 paper, in particular, is important for understanding his view of the nature of mathematics and its relation to deductive logic. It was published concurrently — in the same issue of AJM — with his father’s famous definition of mathematics as the science which draws necessary con­clusions.